Druzy Quartz (also spelt as Drusy or Druse) is a thin layer of quartz crystals covering the surface of a host stone. 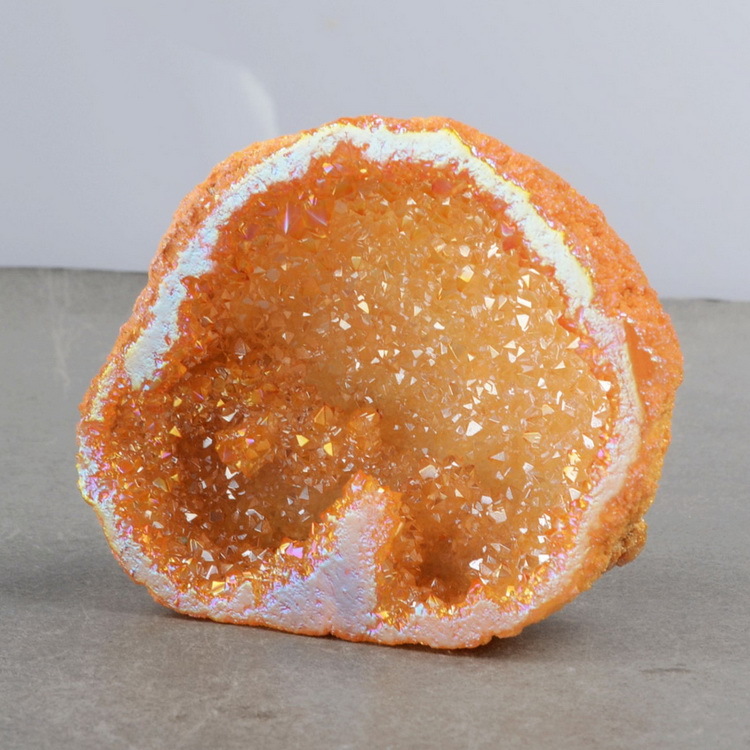 One good example of Druzy is the crystals filled inside the cavity of a geode. The druzy quartz gems grow slowly over millions of years and are found as the very last layer of growth on agate or another colorful base. It does not always refer to quartz, druzy is any kind of mineral found in a plate-like form, such as garnets, calcite, dolomite and malachite. Common colors are white, yellow, brown, red, and orange. Druzy style beads are great for centerpieces in pendants. While they look sparkly and delicate, druzy quartz is a fairly durable gem. The term "Druzy" refers to the tiny crystal which is formed within off on another stone in a large number. When the ground water that carries dissolved silica is forced to get filled into a porous area of rock, rapid cooling occurs and it causes the formation of minute crystals. As in Druzy Chrysocolla, the rock is composed of agatized chysocolla with crusts of small sparkling quartz crystals in tiny cavities. It is beautiful when used in making jewelry. 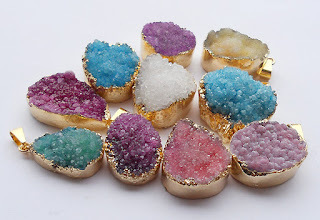 One of the perks to druzy stones is that they are not as expensive as big faceted gemstones and they have sparkle and great color and it can be cut into various shapes with ease. Drusy Quartz is believed to energize and stabilize both your body and aura well promoting creativity. 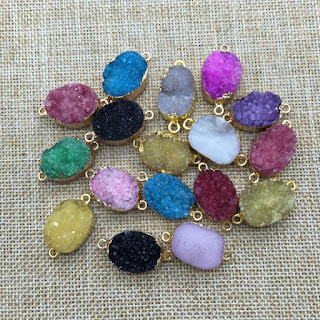 Druzy Quarts is said to aid in balancing and increasing energy. Since ages it has been used to diagnose disease and is believed to enhance natural extrasensory perception abilities. Like other types of clusters, they can empower the energy of other crystals and stones. Placing a stone on the druzy cluster for a day or longer period enhances their energy, especially if placed in moonlight or sunlight for 24 hours. Druzy can be found in any location in which there is a place for water to collect and evaporate on rock. It most often appears along river beds and shorelines. It therefore is helpful for collectors, whether commercial or otherwise, to be aware of the minerals common to an area when they look for a particular type of druzy. Drusy is found within the interior of Quartz geodes. 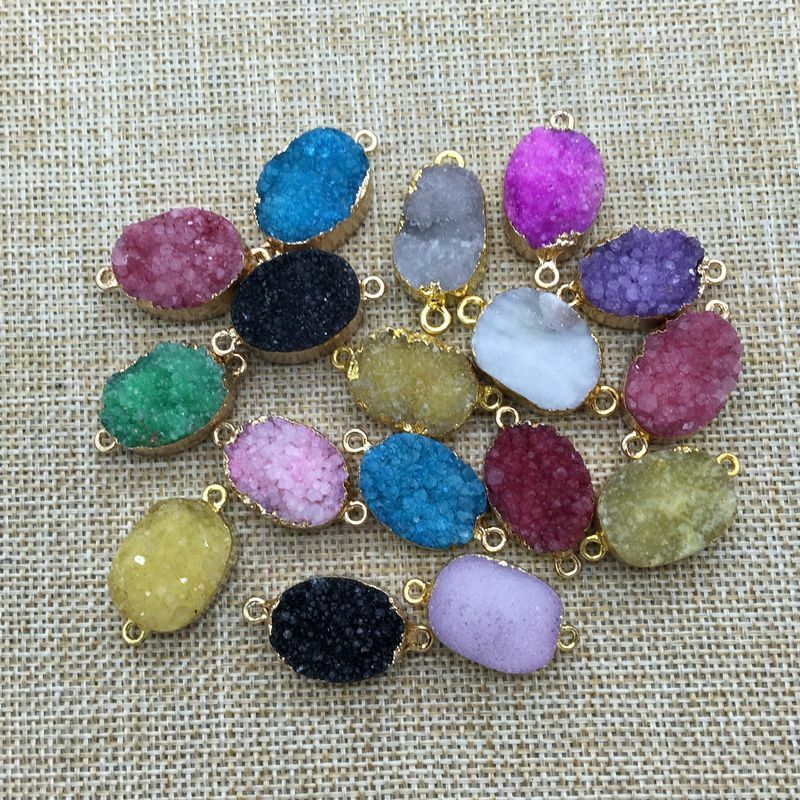 Druzy quartz is made up of many tiny crystals and it has a velvety and soft appearance to it. There can be large formed crystals or many medium crystals with the formation. Treated colorful crystals are sometimes coated with a film of gold, platinum, sterling silver, or titanium. When the Druzy has titanium on it, this adds cobalt, purple, or various rainbow colors. Agates are also easy to dye, so many different shades of backgrounds for the druzy can be made. There are various sizes in this type of crystal there can be very tiny pieces or larger pieces which might be used as display items. The crystals must be cut very carefully as it is easily damaged. The crystal is usually cut fee form to accentuate the beauty of the crystals. In the case of most common quartz material, it is found on the last stages of growth in an agate geode, so pieces are chopped out of the centers of geodes. Some druzy pieces, like garnets, are found as interlocking crystal plates, when found on matrix, they already have a backing, the lapidary artist simply needs to cut out the form and trim off the background matrix to form the cabochon. Vuggy carbonate clusters are often found to have desirable traits, such as the beautiful druzy quartz over sky blue chrysocolla from Peru or the blocks of bright pink calcite from the Democratic Republic of Congo. This is a fun and easy stone to work with. The color and flash make it a surefire way to create something beautiful and eye catching. The edges are usually bezel-set do there’s no chipping with the piece of jewelry. You can also use these stones as display pieces because the agate substrate can be polished to show off the mineral layers. 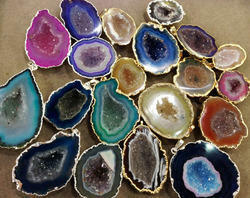 Druzy beads are more like pendants. They are set in a manner that displays the magnificent color and crystal like designs within the beautiful beads. These amazing stones are a result of years of pressure and formation caused by gasses that were trapped as these rocks were being formed and once the rock was solidified, and more minerals were introduced into the rock, crystallizations were formed inside the rock cavity. The colors and crystalline variations are caused by the various minerals present at the formation of the rock. Looking at one of these amazing gems is like looking into a mini universe. Just imagine the time and effort involved in causing this tiny gem that is now here for your enjoyment! Druzy Titanium or Druzy plated with Titanium is a regular Druzy. The colors of Druzy Titanium are very hot and intensely bright. It shifts from a bright hot purple to that of a neon deep blue with some shade of red. The colors of Druzy Titanium differ with the change in the viewing angles. 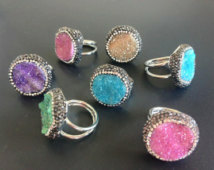 Druzy Titanium is used artistically in jewelry making. The favorites are necklaces, bracelets, rings, earrings and pendants. It has an outstanding luster and is believed to have originated in the US. The usual available color of Druzy Titanium is of golden shade. By far the most commonly found drusy is quartz (agate or chalcedony), but many other species can exist in this form. 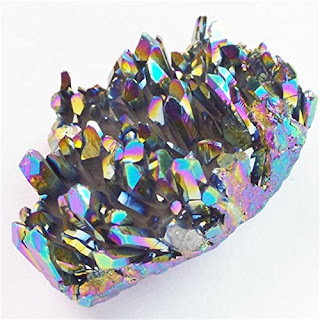 A non ‐ exhaustive internet search yielded the following types: chrysocolla, uvarovite garnet, rainbow pyrite, rainbow hematite, psilomelane, cobalto ‐ calcite, calcite, dolomite, sphalerite, melanite garnet, demantoid garnet, azurite, dioptase, siderite, vanadinite and turquoise. There was even a notation about a drusy pocket found in an iron meteorite! The appeal of drusy material is easy to understand with its multitude of tiny crystals providing a reflective surface reminiscent of sugar or snow. 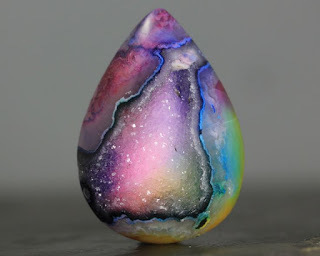 Most none ‐ quartz species of drusy gems, even those with vivid colors like hot pink (cobalto ‐ calcite), day glow green (uvarovite), or multi ‐ Color (rainbow pyrite) Are natural. Naturally Colored quartz drusy is found almost exclusively in muted colors such as white, grey, tan and cream. Many Quartz pieces, though, are dyed black or other vivid colors such as purple, red, green and blue, and some are coated with titanium or other metallic vapor which creates various iridescent finishes. We work with a variety of natural gemstones including druzy, agate, crystal quartz and many, many more. Below are some guidelines to help you care for your new treasure. To clean your natural gemstones, simply wipe them clean with a soft dry cloth. Do not immerse in harsh chemicals, or use ultrasonic cleaners. Always remove your jewelry before using any product that contains bleach. Bleach can cause gold and other metal alloys to breakdown leaving the metal irreparably damaged. Besides chlorine bleach, denatured alcohol, turpentine, acetone, and ammonia can also cause harm. These chemicals can dull or even pit the surface of the druzy and other gemstones. Remove your jewelry before showering, swimming or bathing in hot tubs. Avoid exposing jewelry to shampoo or other beauty care products like hair spray, hair dyes, spray tan, lotions or perfumes. With a little care, your natural gemstone jewelry will remain as sparkling and beautiful as the day we made it! We have used brass / copper metal and other metal on top of that we have done some gold colour plating, so that it will looks like a gold….